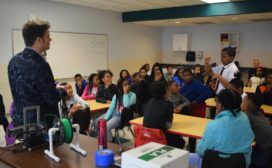 SPR CTO Matt Mead is seldom upstaged, but on a chilly Halloween morning in the LEARN Charter multi-purpose room he was… and by a 5th grader. Matt asked, “Who knows the difference between 2D and 3D?” Hands shot up around the room, but Matt quickly focused in on a tall young man toward the front of the class waving his hand with fervor. Khalil Winston was smartly dressed in a short-sleeved white shirt, tightly knotted burgundy tie, and black slacks. Appearing more statesman than student, he responded confidently, “2D has only two dimensions like length and height. 3D has three including depth. Oh, and I also know how the printer builds!” Clearly Khalil would have commanded the room at length if we weren’t pressed for time. At SPR, we joke that Matt will be a teacher in his second life. He’s easy-going, engaging, and has an unparalleled passion for making technology accessible. He’s the Bill Nye of technology sporting 3D printed shoes and relaying true stories of intrigue and invention that take place on the international space station. Matt’s intellectual curiosity fits right in at LEARN Charter School. 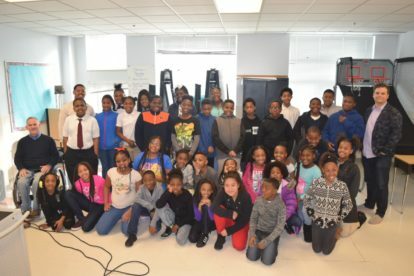 LEARN Charter 5th graders are not your average middle schoolers. 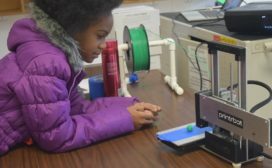 They’re exceptionally bright, well behaved, and unlike most 11 year olds, they have 3D printing as part of their daily rhetoric. 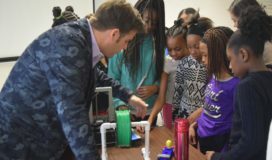 For two years now, LEARN Charter students have been visiting Matt at SPR to learn about 3D printing. 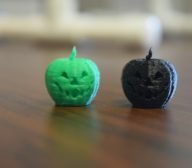 After two years of traveling to SPR to watch 3D printing in action, Matt decided it was time for LEARN Charter students to dream up prints of their own. 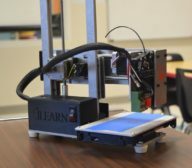 The new Printrbot gently whirred back and forth on its platform as the machine worked steadily to bring its maiden build to life. The familiar oval shape of a diminutive, neon green Jack-o-Lantern was taking form, complete with carved eyes. nose, and mouth and a curly-q stem. The kids were animated and talkative as they filed past the unit, many clearly wanting to reach out and touch it. As he closed out the session, Matt was met with a wave of heartfelt applause. The scholars were ecstatic that Matt was leaving the Printrbot with LEARN Charter as their printer.